Comparing this picture with other blog post available on the internet. 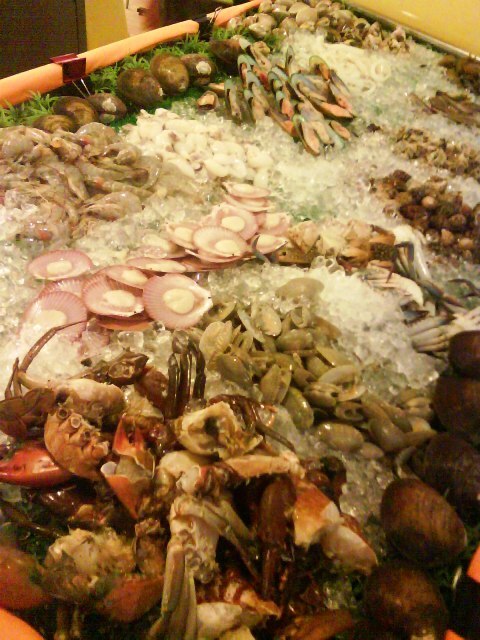 It seems like I Love U Shabu-Shabu is saving budgets investing on the seafoods? It looks like there are lots of empty space on the ices. However I still eat a lot of the big clams lined-up at the corner. They do serve different kind of meat slices (chicken, beef, pork) but you need to get it from the waiter/counter that slice them for you. This is one of their way to control the spending I guess? The colourful sauce they have. Need to mix with sweet soy sauce if I am not wrong. Glad to see the happy couple Liew & Yap =) They are Victory-Cute, aren't they? So here is me, Matthew Gan and KeeWee. Great friends and colleagues I would say =) Nicole and Wern was there too but I didn't have their picture that night. If you are visiting I Love U Shabu-Shabu, make sure you get total 6 friends together as there are now Buy 5 Free 1 Promotions on Weekdays. Ah, maybe now it explain the emptyness of seafood on the ice. It was weekday! Don't actually look that tempting right bro? How much was the buffet? how come i look so FAT !! !